Nelda Anne Bates, age 83, passed away peacefully on Sunday evening, February 3, 2019. She was born in Lebanon, TN, to Paul Leverne and Mary Kate (Allen) Mitchell. She was an only child and loved by all. She was an active majorette and accomplished skater. 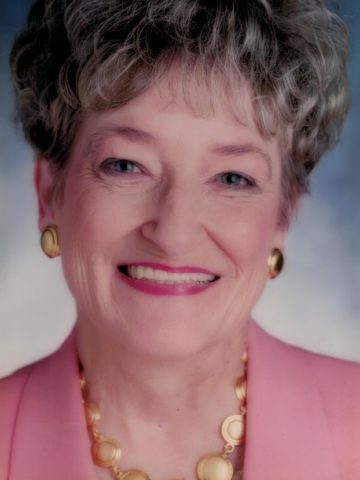 As an adult, she thrived at Maryland Farms as Director of Leasing and was honored with an Outstanding Service Award from the Brentwood Chamber of Commerce in 1982 and the National Women’s Executive Award in 1986. She also loved working with McArthur Sanders Real Estate and received the Creative Award of Excellence in 2007 for her creative cookbooks for the company. Nelda loved bowling, and she traveled all over and met many friends through this activity. She became a Life Member of the Nashville Women’s Bowling Association in 1987. Not only was she successful and liked in the working and sporting world, but she was active with her children’s schools as well. She started a bowling league at Franklin Road Academy, and she wrote a play for Battle Ground Academy. She was always participating in all the school activities and volunteering her creative skills and time. No one could hold Nelda back, and no one wanted to because she was always great! She loved her relatives, co-workers, bridge friends, poker buddies, Villa Maria buddies, her pastor Tony Langton, and mainly her family. Although stubborn, she was generous and funny. She was loyal and compassionate. She was unforgettable. The love for her grandchildren, and great grandsons was tremendous, and her dog Benny was the most spoiled pet ever! Nelda is survived by her son Mitch Bates (Old Hickory, TN), son-in-law and daughter Scott and Tiffi Gentry (Nolensville, TN), grandson-in law and granddaughter Brian and Sloan Lowe (Nashville, TN), grandson-in-law and granddaughter Garrett and Katie Weller (Winter Park, FL), granddaughter Tori Bates (Chattanooga, TN) and great grandsons Weston and Parker Lowe (Nashville, TN). Nelda was known as Gertie the Witch to her grandchildren, which was a name she gave to herself being funny, but her real name was Grandie, and honestly that was the perfect name for being grand in life and memories. Funeral services will be held Wednesday, February 6, 2019, at West Harpeth Funeral Home, 6962 Charlotte Pike, Nashville, TN. Visitation for family and friends will be from 10:00-11:00 a.m. with a short service to follow. Precious Nelda was one of my first friends when I came to Villa Maria. She and I have remained friends since that first day and we always greeted each other with a smile and a hug and she always would say, “Wanda, I just love you”. Miss Nelda, I love you, too, and I will never forget you. You will always be missed here at the Villa and in my life. Rest in peace, my sweet friend. God bless you Nelda, we will miss you, pray that you have found peace in your new life. Jean and Ben. Oh what a remarkable lady! While at FRA, Nelda was a rock to all of us. Loved her and my daughters loved being a member of the FRA Bowling league. Mitch and Tiffi, thanks for sharing your Mom with us. She was a favorite. Love you both. Lucy and Tom Bottorff, Karen and Paige too.